Additional Info: A native of the Los Angeles area, Ed Peffer works professionally as a saxophonist, flautist, clarinetist, composer and arranger, and private woodwind instructor. He received a Masters in Music in Commercial Music degree in performance and arranging from California State University Los Angeles, and got his Bachelor of Arts in Music degree at California State University Long Beach. 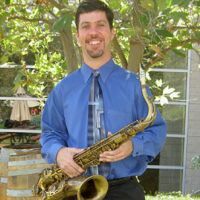 Ed was appointed as the director of the first jazz ensemble at Irvine Valley College in the Fall of 1999, where he currently teaches the Instrumental Jazz Ensemble. Ed has also taught Jazz Combos, and Jazz Improvisation, and Music 1: Basics of Music. Ed has worked with numerous professionals in the Southern California area, including Don Menza, Tom Scott, Dan Higgins, Eric Marienthal, Bill Watrous, Scott Martin, Pete Christlieb, Ron Stout, Gary Foster, Oscar Brashear, Roy "Guitar" Gaines, and countless others. He has performed as a sideman for many different musical productions, including: West Side Story, The King and I, Gypsy, Anything Goes, Man of La Mancha, Guys & Dolls, Phantom, Wizard of Oz, Pirates of Penzance, La Cage Aux Folles, Will Roger's Follies, Crazy for You, and many others. Ed currently performs with a variety of groups such as UnTamed World, Pete Jacobs and the Wartime Radio Revue, Big Noyz, Electric Mayhem, the Karl Aranjo Jazz Attack band, and Big Band 2000, Big Box of Men, as well as his own jazz duo with guitarist Kevin Holmes, and his own contemporary jazz quintet, Soul FX. This group recorded their first demo-CD, Ed Peffer and Express, which was released in February of 2001, and is available for purchase at www.cdbaby.com.